The Resurrection by Piero della Francesca, a fresco judged by Aldous Huxley to be “the best picture in the world,” is receiving a much-needed restoration. A team from Florence’s conservation institute the Opificio delle Pietre Dure will spend a projected 18 months in the Upper Tiber Valley town of Sansepolcro, Tuscany, restoring the 15th century masterpiece and they will do it in plain view of the public thanks to a custom scaffolding bridge that will leave the painting visible while experts work on it. Public restorations are increasingly common these days, but this project will vastly expand the range of public view with an app that will allow people to follow the restoration from the comfort of their own smartphones. The app debuts in January. Restoring The Resurrection is a complex problem. Piero della Francesca used different types of paint — fresco, tempera — and design techniques. Pigments like cinnabar red lacquer, malachite and white lead are typical of tempera. Because of the diverse materials, restorers will have to work on the painting inch by inch. The Opificio experts have studied the work using 20 non-invasive techniques — among them UV imaging, infrared imaging, careful visual examination of the surface — and found areas where the paint is discolored, flaking and cracking, and which of those are original, which past restorations. There are places where the fresco’s plaster is peeling off the wall. A 3D reconstruction of the work derived from the imaging data indicates that damage and dirt have obscured many of the painting’s unique perspectival elements. The wall itself is in need of repair because multiple earthquakes over the centuries have caused structural problems. Although it adds another layer of difficulty to the project, treating the wall has an upside. Restorers are hoping it will answer questions about when the painting was moved to its current location. Della Francesca painted it for the Town Hall in the 1460s to celebrate Florence returning control of the building and some measure of political autonomy to Sansepolcro, but it was originally on the wall of another room in the building. The bottom-to-top perspective suggests it was once placed higher than it is now. It was thought to have been moved to its current room in the 16th century, but there are a lot of open questions about the history of the work. 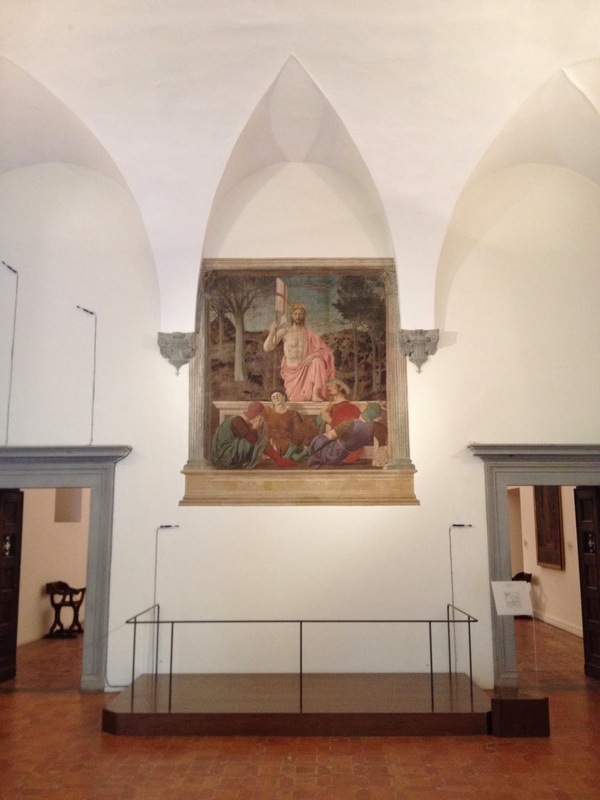 dei Conservatori at Borgo San Sepolcro finds the stupendous Resurrection almost as Piero della Francesca left it. Its clear, yet subtly sober colours shine out from the wall with scarcely impaired freshness. Damp has blotted out nothing of the design, nor dirt obscured it. We need no imagination to help us figure forth its beauty; it stands there before us in entire and actual splendour, the greatest picture in the world. If Huxley’s description is accurate, the condition of the work has degenerated precipitously in just 90 years. 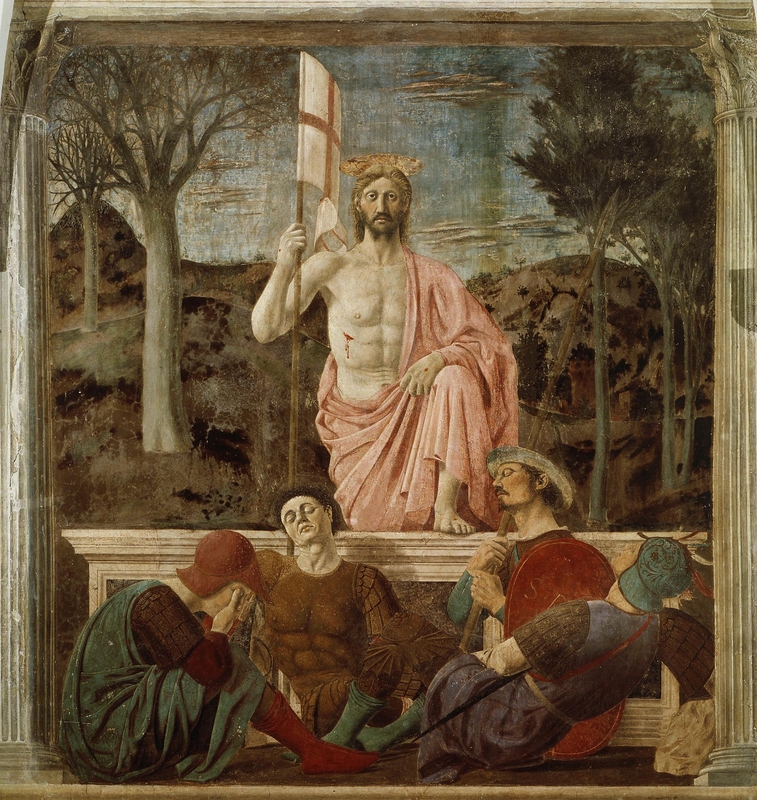 The Resurrection has a profound connection to Sansepolcro. Piero della Francesca was a native son (the sleeping soldier in the brown armour underneath the staff of Jesus’ banner is thought to be a self-portrait). He incorporated the city’s symbolism into the painting. The rock in the bottom right depicts the stone from the Church of the Holy Sepulchre that according to legend pilgrims Arcanus and Aegidius brought back from Jerusalem with them when they founded the town they then named after the church. 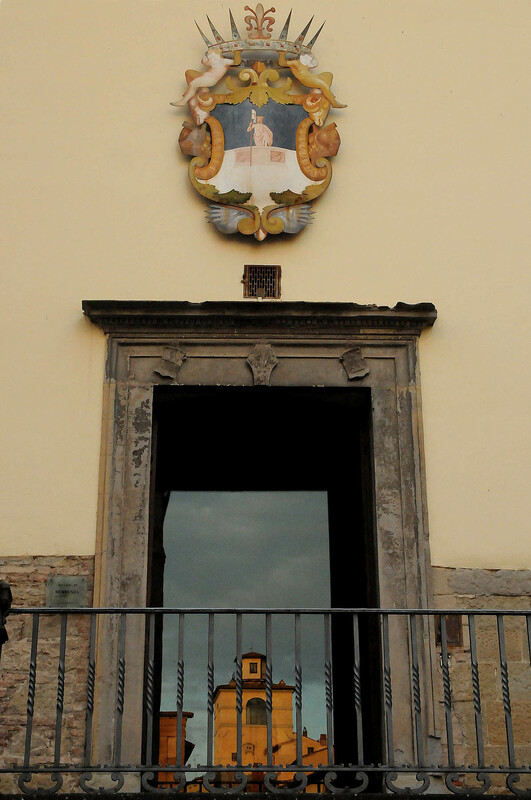 The Christ figure from the painting is the central element of the city’s coat of arms. Then there’s the more recent history when The Resurrection saved Sansepolcro from destruction in World War II. In 1944, Royal Horse Artillery captain Anthony Clarke was ordered shell the city in advance of Allied infantry troops. 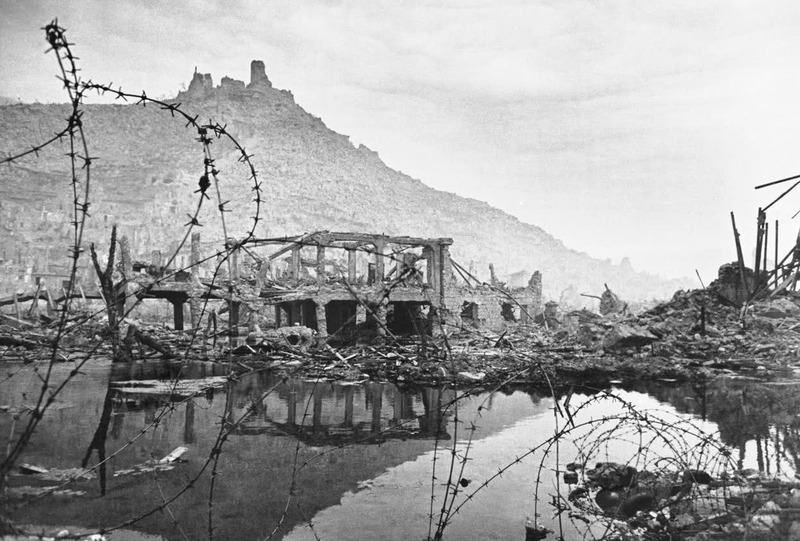 Clarke had seen the obliteration of the monastery at Monte Cassino as a result of Allied bombing, a destruction that turned out to be not just futile (the Germans weren’t occupying the monastery as the Allies believed) but counterproductive since German paratroopers moved into the ruins which gave them outstanding cover and made them very hard to dislodge. He had also read Huxley’s essay and remembered, even though he had never seen the painting, that The Resurrection was in Sansepolcro. Taking an enormous personal risk, Clarke did not relay the order to fire. He later said his commanding officer had come on the radio urging him to get on with it so he had to stall for time, peering at the town through binoculars and assuring his commander that he could see no German targets to go after. It was a brave action. Had Allied infantry been ambushed as they advanced on Sansepolcro, his court martial would have been brutal. But, for the love of art, he kept the guns silent. The Germans fled and the town was liberated the following day without any damage to the 500-year-old work of art. There’s a street named after Tony Clarke in Sansepolcro now. The restoration is estimated to cost 200,000 euros ($250,000). The town council has scared up 40,000 euros from its threadbare budget. Former Buitoni pasta and sauce executive Also Osti has pleged 100,000 euros. A friend convinced him to donate, and he was easily persuaded because he although he now lives in Switzerland, he lived in Sansepolcro, headquarters of the Buitoni company, for many years. His son was born there. The city is working on raising the remaining 60,000 euros from other private donors. Meanwhile they have enough to get started and keep going for a while. This entry was posted on Monday, December 1st, 2014 at 11:41 PM	and is filed under Modern(ish), Museums, Renaissance. You can follow any responses to this entry through the RSS 2.0 feed. You can skip to the end and leave a response. Pinging is currently not allowed. if you need to Resurrect. I’m more of a car fanatic but artwork has really caught my interest these past few years. I’d really like to know more about the process of restoration and what goes into the actual costs. What is the name of the app? I can’t find it anywhere. I can’t find it either. I hope it wasn’t a pipe dream that never got off the ground. I’ve sent emails to the Opificio and the Museo Civico and will let you know the response. Does anyone know what the status of the restoration is? Iis it worth visiting right now?